Where patients with a similar mental illness are associated together it is often possible for them to apply to themselves the questions brought forward by the various members of the group, to recognize their problems mutatis mutandis as their own, and to make a new approach to the specific subjects troubling them. It is therefore an advantage to place together patients with more or less similar diagnoses in smaller therapeutic groups, so as to give them the opportunity to find mutual support and help in facing and solving the difficulties and mental conflicts which they have in common. Small groups with an average of six to eight members are naturally easier for the therapist to supervise than the large groups we have mentioned. It is also easier to attract individuals into the discussion than it is in the large groups, some members of which are always able to withdraw into passive silence. In a small group the participants are more continually in the limelight than in a larger one and so find it more difficult to stay outside the activities of the group. If they have agreed to take part in a therapeutic circle or this kind, they usually feel more or less duty bound to contribute something to the success of their treatment and that of the others. Individuals are considerably more responsible for themselves and the others than in large groups, and it is even clearer that the patients can be brought, through group psychotherapy, to take an active part in their treatment (Battegay, 1961). The emotions of some participants bring out similar latent feelings in the others. Affects are mobilized and set to work. We have therefore spoken of a “reinforcing effect” of the (therapeutic) group (Battegay, 1961). Long-repressed emotions, which would otherwise have remained imperceptible or unclear, come out into the open. In group psychotherapy unconscious emotional conflicts often come to light more quickly. However, it is obvious that the problems that come to the surface can hardly ever be worked through as intensively and thoroughly in a group as in the tête à tête of classical psychotherapy. 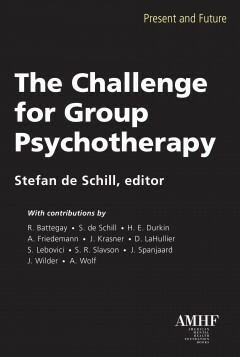 It is true that among the different participants more instances are brought forward than in individual therapy between patient and analyst, but the observations of the other group members are scarcely as well-founded as those of an experienced therapist. In addition there is scarcely enough time for a detailed and profound examination of all the associations which come out in a group. Having said this, we must add that group psychotherapy can bring deep-seated conflicts to light as quickly or even more so, but these conflicts cannot be as thoroughly examined as in the classic psychoanalytical situation with only patient and analyst present. Transference feelings usually become clear much faster in small groups than in large ones. We find quite often, for example, that a patient may consider a fellow patient as her sister, the therapist as her father, and the whole group as her family and act towards them accordingly. At about the same time similar or different emotional stirrings appear between other members of the group. Resistances to the analyst’s approach are also often seen more quickly in the small group than in the large one. Resistances do perhaps appear early in larger groups, but owing to the greater number of members they are often masked. In small groups the resistance of individuals or the whole group against the therapist or the therapy is naturally of more importance; they are more quickly observed, and both the doctor leading the group and the patients must come to terms with them. Here too, multiple resistances of one participant against another and/or the whole group appear, and at the same time there are similar or dissimilar resistances by other members of the group against others of their fellows. In small groups the interaction between the different group members, and between individuals and the group as a whole is often deeper and more intensive than in large groups. We must also take into account the fact that in larger groups only a few patients usually play an active part, while the others are passive, keeping out of the evolution of the group to a greater or lesser extent. If the patients are put together in a small therapeutic group with others suffering from the same illness they are given a chance to escape from loneliness and from the anxieties caused by feeling themselves in a special position. Often they are quicker to gain courage to fight against their illness and to work with the doctor to overcome it. The “togetherness” of the group also allows these patients, who are as a rule very sensitive and easily hurt, to achieve a certain detachment and independence of their environment. They are thus more readily protected from unfavorable outside influences than they would have been if left to themselves. In order to give a fairly concrete picture of this type of group psychotherapy, we will allude briefly to our experiences with our various treatment groups. The considerable number of alcoholics admitted to our hospital is in itself enough to induce us to deal with them not only individually, but also in therapeutic groups. These patients are eminently suitable for group treatment. Very often they spontaneously seek out a group of “colleagues” in order to drink in company. Alcoholics have a great need for society. Either the group gives them back some of the security which they enjoyed to the full in childhood through an indulgent mother, or, if they were frustrated in childhood by their mother and did not get enough security from their father, it gives them for the first time that comforting feeling of companionship, which they have never had up to now. As we said in an earlier work, these patients find in the group an “affective forum” around which to gather. Our policy now is to invite alcoholic patients treated in our hospital (Battegay, 1958) to join our “internal” group. We offer them nonalcoholic drinks and stumpen (a cheap cigar very popular in Switzerland) as a substitute for the forbidden alcohol, so that they may have at least some satisfaction for their usually heightened oral cravings and to give them a sense of the genial atmosphere associated with the tavern. Discharged alcoholics are also gathered together in an “external” group to give them an emotionally satisfying milieu in which they can feel at ease without being exposed afresh to alcohol. We hold the sessions for discharged patients in a nonalcoholic restaurant in the town. The hospital group meets for an hour every week, but the discharged patients’ meetings often last longer, up to two hours. The patients in the “external” group are mainly on Antabuse (disulfiram). The hospital group is led by a doctor together with a social worker specially appointed for the care of alcoholics, whereas the outpatients’ group is run entirely by social workers. Both groups are open; that is to say, new patients are constantly joining them and the old ones leaving. Alcoholics usually have a strong desire to become part of a group, and so as a rule they have no difficulty in fitting into this type of society. At an early stage they begin to show tendencies towards identification. If, for example, one of the participants asserts that the cause of his drinking is to be found in his wife or in her lack of understanding of him, the others too insist that their wives treat them unfairly at home. This often happens even when relations between the couple are good and loving. There is a danger that these patients may be content to blame their wives or other relatives and their environment and not bother about the solution of their own problems. Thus, although the alcoholic patient’s identification tendencies can make it easier for him to fight against alcoholism, since in this way he can work in association with others, they have also certain disadvantages, such as the risk that their natural tendency to shift the responsibility for themselves and their drinking to others may be strengthened (Mullan & Sangiuliano, 1961). It is very understandable that these patients should express in group therapy the most acute and varied resentments against their whole environment. On the one hand it is indeed essential that these people, who often feel very frustrated in the outside world—often they cannot cope adequately with external reality—should have the opportunity to be listened to and accepted by an understanding circle and rid themselves of their hostile emotions. But on the other hand it is no less necessary for them to recognize their projection tendencies for what they are. Many of the emotional relationships between the members of these groups have their origin in childhood experience. An elderly alcoholic, for example, speaks to a young member of the group as though he were his son. Problems and conflicts which occupy the patients in their associations with their relatives and others around them can come to light in this way. The patients learn to recognize the emotions which come to the surface and thus to deal with them. Transferences become obvious, and with their help they find it easier to free themselves from the burden of the past. Guilt feelings, which weigh heavily upon alcoholics and are harmful rather than therapeutic, leading to fresh bouts of drinking, often come to light in the group sessions, though usually only after much resistance. If the sufferers realize that the group, including the therapist, does not judge them but continues to be friendly towards them, the mistrust which is often present in alcoholics is dispersed. With group therapy we can give alcoholics the possibility of fighting alcoholism together with fellow-sufferers, in the security of a circle of friends. They support each other mutually, feel stronger and are better able to withstand new temptations to drink. The outpatients’ group of former alcoholics does particularly sterling service in this respect. The patients often find in such groups a support that can save them from relapses. A promise of abstinence, given before a group of patients who are all striving to keep away from alcohol, can often be more readily kept than when it is given to a therapist alone. The greater extent of such a circle leads to an increased feeling of responsibility on the part of those concerned, and they will often be better able to keep away from alcohol than they would have been without this extra method of treatment. Besides, the outpatients’ group makes it possible for the social workers to keep in touch with those in their care more unobtrusively than by individual visits. Naturally we collaborate actively with Alcoholics Anonymous. This body consists mainly of former hospital patients who have taken part in the inpatients’ group. For this reason, and simply because the work of Alcoholics Anonymous is carried on chiefly by the group system, their successes depend on similar principles to those of group psychotherapy. When these patients give their word to Alcoholics Anonymous, they feel it subjectively as binding upon them, and it is easier for them to give up alcohol than if they were thrown upon their own resources. For some years we have admitted to our hospital in growing numbers a type of patient that is common in this country: those who abuse “light” analgesics—mostly combinations of phenacetin with caffeine and a hypnotic, which are often taken for headaches with various etiologies—and hypnotics—often preparations without barbiturates, which are available without prescription—(Kielholz, 1964). Since these patients are often, to a greater or lesser extent, unable to relate to others, the therapeutic group gives them above all the opportunity to communicate with individuals who, having similar difficulties in human relationships, are closer to them than people who can communicate more freely. We run these groups of drug addicts without any external aids. When we began in 1957 they met for an hour twice a week, but we changed later to meetings every two weeks for just over an hour. When the group was meeting less often, it became possible to include discharged patients. As a rule the participation of former patients has a favorable effect on those still hospitalized, because they can learn from the experiences of the others. It is not easy for drug addicts to form a new group after leaving hospital, and for this reason too it is a good idea to bring them into the hospital group. This group is led by two doctors. A social worker of our hospital, who was leading this circle temporarily, successfully carried out sessions of “autogenous training” alternating with the group discussions (Schultz, 1956). This combination, which naturally presupposes a sound knowledge of this method of relieving tension, was effective in encouraging the participants to express themselves and in deepening the emotional level of group discussion. The drug addicts’ group is kept closed as far as possible, as these patients generally have difficulties in adapting to constant changes of people and situations. We admit a new patient to an old group only occasionally, when the group members have declared themselves willing. The drug addicts’ suspicion of their fellows often shows itself in the psychotherapeutic group.